The aluminium frame that provides support for all the elements. It ensures the proper positioning of the elements during launch of the rocket and secures the subsystems against mechanical damage. In the same time it plays important role in the thermal stabilization of the satellite. If one of the subsystems is generating high amounts of heat it is absorbed by the structure (it has very high thermal capacitance). The excess heat is then radiated from the structure directly into space. 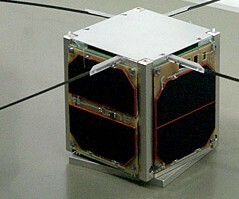 Construction of the four edges of the cube are described by the CubeSat's specification. While the satellite is taken to the orbit those edges are in contact with a special container (so called P-POD), that releases the satellite. PW-Sat is powered entirely by the energy coming from Sun. It is converted into the electrical current by eight solar panels that are placed on the satellite walls. Panels placed on one wall provide minimum 2W of power. This power is partially used to charge the li-ion battery that provides the energy when the satellite is in the Earth's shadow. The solar panels efficiency is of the order of 27%. PW-Sat will be also equipped with additional, experimental panels. They will not be connected to the main power system - they are part of the experiment only and they are placed on the deorbitation structure. It is necessary for sending the data back to the Earth and for receiving commands from a ground station. It consists of two modules: the communication module and the antenna module. Four tape antennas of 55 cm length create the antenna module. During the take off they will be folded and they will be released half an hour after separation from the rocket. The unfolding process will take only 3 seconds. The communication will be maintained on two frequencies: 435,032 MHz (uplink - to the satellite) and 145,902 MHz (downlink - from the satellite). A few weeks after PW-Sat's separation from the rocket the ground station will send a command to unfold a tail-like structure. It is over one meter long deployable spiral with rectangular cross-section. On all four sides it is covered with elastic solar panels. During the take-off it will be hidden inside the satellite. More about the PW-Sat's payload you can find on the "Experiments" page. PW-Sat is not equipped with the stabilization system. Its orientation can be estimated based on the output from the solar panels. It is managing the operation of the entire satellite. Through the communication system it receives commands from Earth and engages subsystems necessary carry out the task. It also gathers information, i.e. about the temperature, buffers them and prepares for transmission to the ground station. The main computer is a 32-bit ARM7 CPU - AT91SAM7A1. PW-Sat is also equipped with special Access Point that enables the monitoring of the satellite subsystems when it is already installed in the P-POD container. 17:27:58.290 UTC: EPLOYMENT STATUS 0x01 0x00 E -1 END. 17:27:58.730 UTC: EMP 0x37 0x02 E -1 END. 17:28:27.520 UTC:  DATA D 415 RSS 961 TRP 7 TFP 6 TC 0 RC 75 AT 214 PB 409 E -1 END. 17:28:27.980 UTC:  DATA TRANSMITTER STATE 0x01 E -1 END. 17:28:28.530 UTC:  DATA RUT 12 0 0 TUT 12 0 0 RE -1 TE -1 END. BATT1T 0x020C E -1 END. 17:29:07.130 UTC: LASH E -1 END. 17:29:16.450 UTC:  DATA  0xFFFE 0xFFFE 0xFFFD 0xFFFE E -1 END. 17:30:05.820 UTC: EPLOYMENT STATUS 0x01 0x00 E -1 END. 17:30:06.260 UTC: EMP 0x36 0x02 E -1 END. 17:30:29.870 UTC:  DATA TRANSMITTER STATE 0x01 E -1 END. 17:32:11.850 UTC: EPLOYMENT STATUS 0x01 0x00 E -1 END. 17:32:12.300 UTC: EMP 0x3B 0x02 E -1 END. 17:32:21.660 UTC:  DATA D 412 RSS 960 TRP 7 TFP 6 TC 0 RC 77 AT 207 PB 407 E -1 END. 17:32:22.120 UTC:  DATA TRANSMITTER STATE 0x01 E -1 END. 17:32:22.660 UTC:  DATA RUT 16 0 0 TUT 16 0 0 RE -1 TE -1 END. 17:32:46.040 UTC:  DATA  0xFFFF 0xFFFD 0xFFFE 0xFFFD E -1 END. TX- 0x0012 E -1 END. 17:34:18.470 UTC:  DATA TRANSMITTER STATE 0x01 E -1 END. 17:34:18.990 UTC:  DATA RUT 18 0 0 TUT 18 0 0 RE -1 TE -1 END. 17:34:19.510 UTC: EPLOYMENT STATUS 0x01 0x00 E -1 END. 17:34:19.930 UTC: EMP 0x3C 0x02 E -1 END. 17:34:37.270 UTC:  DATA  0xFFFE 0xFFFF 0xFFFF 0xFFFD E -1 END.